A national competition sponsored by NASA and run by a University of Washington educational consortium is aimed at inspiring students to think about science, space travel, and the history of America's journeys to the moon. He was only in elementary school at the time, but Robert Winglee vividly remembers watching, on a black-and-white television, the moment when American astronaut Neil Armstrong set his boots on the surface of the moon nearly 50 years ago. The moon landing was one of several events that helped launch his own interest in space, and a career as a professor in the University of Washington’s Department of Earth and Space Sciences. He is an expert in space technologies, including space plasmas, plasma thrusters and rocket systems. No astronauts have walked on the surface of the moon since 1972. As the head of a NASA education consortium, Winglee wants more students to be excited about the upcoming anniversary. That’s how he and his colleagues came up with the Apollo Next Giant Leap Student Challenge, a competition for students in grades 5-12 that asks them to use a drone and Lego Mindstorms robots to wrestle with science, engineering and computer programming problems. The national challenge is being run by the UW-based Northwest Earth and Space Sciences Pipeline (NESSP), which Winglee directs. 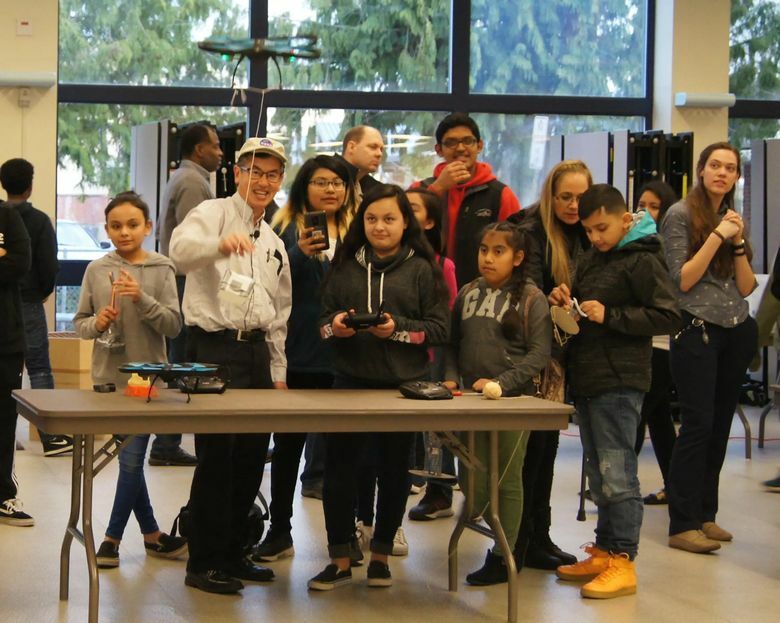 There’s no entry fee, and some schools that qualify will be eligible for a free kit that includes a drone and a programmable robot. The organizers will also help with fundraising, and can provide drone and robotic training, as well. Here’s the challenge: Each team will build a replica of the lunar module, then use a remote-controlled drone to land it on an 8-by-10-foot map of the moon’s surface. They’ll also modify and program a Lego Mindstorms EV3 robot to explore the lunar surface and bring back a rock sample. High-school students will have an additional challenge: retrieve the team’s lunar module, using the drone, and bring it back to the starting line. And students from all grades will also have to choose an item to leave behind on the surface of their virtual moon — something that is relevant to their community, or their school. The work could be done in class, after school or as part of a summer camp — “we’ll support all three options,” Winglee said. The competition grows from work Winglee’s group has been doing for the past three years across the Northwest states — especially in low-income, underserved and rural schools — to drum up interest in science, technology, engineering and math (STEM) by running free science camps. Winglee says the results are promising — and he’s hoping the challenge will be another way to inspire kids in schools that have limited funding for science projects. Students who are tested after the camps show an increased interest and expertise in STEM. And the tests show that students in underserved communities benefit the most, catching up to their peers in better-funded schools. When the consortium’s scientists first started working with low-income schools, they found that many students were certain they couldn’t do programming, or build a rocket from a kit — one of the camp’s popular activities. After the camps, that attitude turned around. “They would walk away with such confidence” when they built and launched a model rocket, Winglee said. When Winglee’s group proved how successful the camps could be, NASA gave him the go-ahead to create the national competition. The entry period for the Apollo challenge started this month, and teams can enter until March 31. Participating Northwestern teams will come together in July to show off their work in Seattle. The winning team from here and 12 other regional locations will get a trip to the Johnson Space Center in Houston this summer to be part of the 50th anniversary celebration. All teams will get travel money from NASA to help support the trip, and local partners Museum of Flight, Pacific Science Center, Microsoft and Boeing will assist the Northwest winners. The Northwest Earth and Space Sciences Pipeline consortium was created in 2016 with a $10 million cooperative agreement that established a NASA hub in the Pacific Northwest.